Lavish wedding ceremonies are back, with inflated budgets, as social pressure remains huge on the family to organise a once in a lifetime celebration that reflects not only love but also your social status. New, creative tools are at hand to help. Garima Talwar, 25, from Punjab, has a dream. She wants a wedding that people will remember. She sees herself wrapped in jewellery, wearing a rich lehenga (Indian bridal dress), being carried to the wedding venue – a desert place – in a palanquin. And this PR professional won’t mind spending INR 10 million on it! Abhilash Pushpan, a banking professional, has decided that he will get his son married only when he has INR 6 million set aside over the next five years. Indians dream of a grand, extravagant wedding – a scene straight out of a hit Bollywood film with the accompanying décor and humdrum. Huge halls draped with ostentatious veils and decor, loud music along with dance performances by professionals, a guest list running into several hundreds, hustle and bustle that carries on for several days without a break, lavish dinner spreads, colourful costumes and what not. Indian wedding is still a long affair, lasting for 4-5 days and religious ceremonies form a key part of the festivities. The religious part in a Hindu wedding can vary but usually the bride and the groom still notably perform the Saptapadi (seven steps in Sanskrit) ceremony. They perform seven circumambulations or phera around Agni (holy fire), a symbolic witness to their union for seven lives. At the end of each phera, the bride and the groom take a specific pledge, in presence of their families, regarding their future life together. One of the colourful aspects of the traditional wedding in North India is when the groom leads a procession, traditionally on horse back, through the streets of the neighbourhood, riding a richly decorated horse. In a high-end wedding, it is not rare that a bride wears pieces of jewellery costing between Eur 9,000-37,000 each, with an overall budget of about Eur 175,000 spent on jewellery alone. It can reach even the million euro mark in some of the most lavish ones. Food is an other important element. The menu can vary as dramatically as a food court in a large shopping complex. Most weddings have large choice of Indian meals – vegetarian and non-vegetarian, with a fair share of Chinese, Italian and increasingly Mexican or Thai dishes. Depending on the families of the bride and groom, serving of alcohol is also common, and here too wines and imported beverages are gaining ground. With the changes in urban Indian lifestyle, with members of families living in different cities and busy with their own lives, the task of preparation is increasingly getting transferred to wedding planners. The whole planning work can be enormous and can easily cost thousands of euros. At each stage, the clients have a wide range of choice. Starting from the invitation card, as hundreds are printed for each wedding. “The wedding card market in India for the 10 million marriages performed annually is worth INR 80-100 billion (Eur 1.1-1.3 bn),” Ravish Kapoor, who designed the invitation cards for Bollywood actresses Shilpa Shetty and Karisma Kapoor’s weddings said in an interview with the Times of India. The “dark side” of the wedding budget remains the dowry. Varying sharply, according to the families involved, dowry as a social practice has continued to thrive and indeed increase even though it has been banned legally for over four decades in order to protect women whose in-laws have often tortured and harassed them, seeking more dowry. An average dowry mix today contains some gold ornaments, a vehicle – ranging from a two-wheeler to an upscale imported SUV, lot of clothes, utensils, household electronic items, a lot of cash and sometimes even property. Unfortunately, despite the modern education and spread of liberal attitudes through various media like the internet, the evils of dowry continue to be a scrouge for Indian weddings. 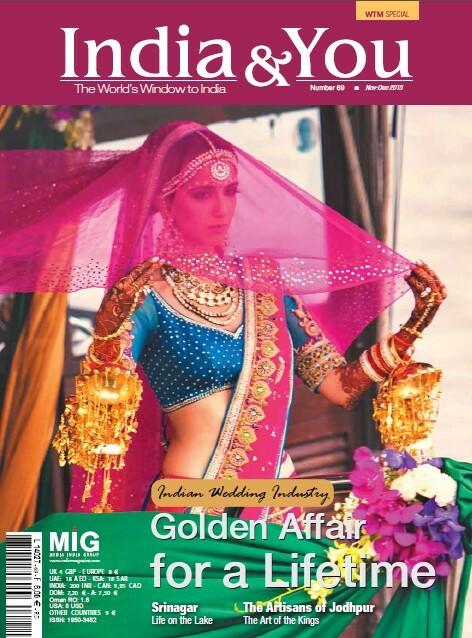 Latest analyst reports estimate the Indian wedding industry to be a staggering EUR 34.5 bn and growing at a rate of 20 to 25 pc a year. A study by retail news platform, Indianretailer.com, says that with about one marriage per family every 20 years, the country averages roughly 10 million marriages every year. An average 30 to 40 grams of gold is bought in every marriage across the country, thus the total consumption of gold, just for the weddings is between 300 to 400 tonnes annually. And there is no end in sight for this inflationary trend in the wedding market. It is expected that the per capita income in India will rise by 300 pc in the next two decades. With half of India’s population under 29 years of age, the marriage market is set to boom like never before over the next five to ten years. 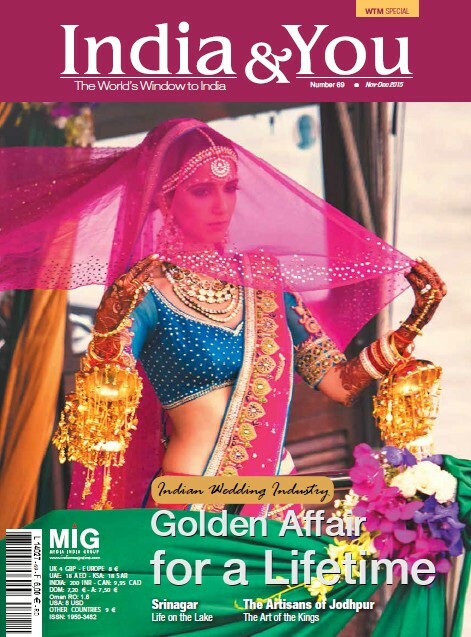 Read the full version of this article and our dossier on the Indian wedding Industry in India & You – November – December 2015 (WTM London special issue).